Now that school has started, homecoming is right around the corner! This fancy updo would be perfect and I think you will love how easy it can be to recreate once you break it down into steps. 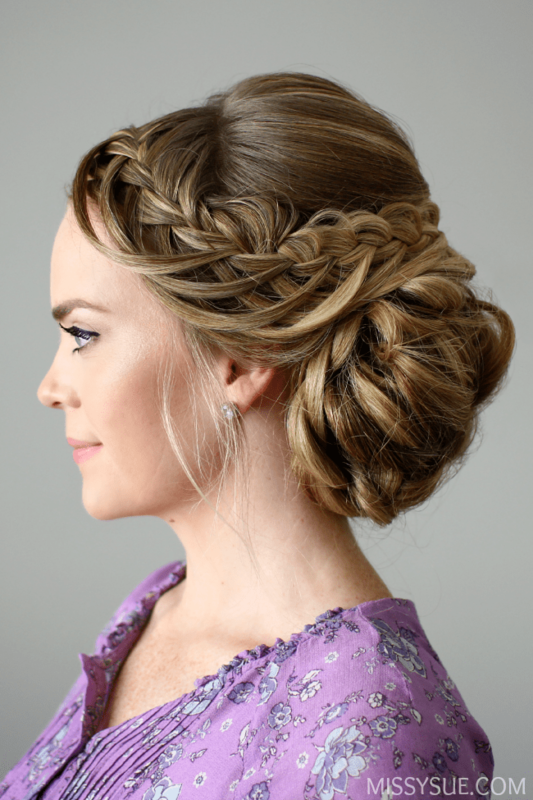 The trickiest part is the braid which is from this tutorial, Looped Half Up Crown Braid, but is such a soft, pretty style that it would look great for any special occasion. I hope you try it out and love it as much as I do! Love this look? Check out these as well! Step 2 / Divide off the front sections of hair, from the part down to the ears, clipping the forward sections out of the way. Step 3 / With the back section, divide off a small section at the crown and clip it out of the way. Step 4 / Tie the rest of the hair, at the back, into a low ponytail, slightly off-center to the left. Step 5 / Separate off a small section of hair from the ponytail, create a small loop and lay it against the head. Then pin it in place with bobby pins. Step 6 / Continue creating loops and pinning them until all the hair from the ponytail is pinned. Step 7 / Let down the hair sectioned off at the crown. Twist the section together, towards the right, and pin it at the top of the bun, letting the rest of the section fall to the right of the bun. Step 8 / Twist the end of the crown section together and wrap it clock-wise around the bun, then pin down the ends, tucking them under the bun. Step 9 / Let down the section on the right side. Swept it over the top of the bun and pin it place around the bun. Step 10 / Let down the section on the left side. Step 11 / Pick up a small section of hair near the part and create a Looped braid until it reaches the back of the left ear. Step 12 / Braid the rest of the section into a regular braid. Step 13 / Drap the braid over the top of the bun and pin it in place. Step 14 / Spray the style with a firm-hold hairspray and smooth down flyaways. 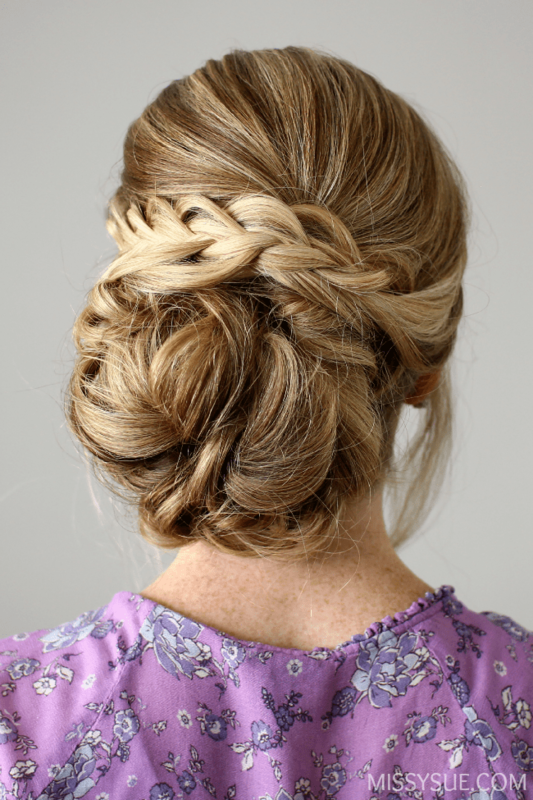 Hey, this looks great, but just wondering: do we really need 30-40 bobby pins? Because that seems like a huge amount. I’ve only ever used six in one hairstyle, at most. Looks fantastic! Wish I had long enough hair to try it! I love the cascading loops too!